Bill Thomson of Knight Frank in Tuscany believes that, increasingly, families are moving abroad as a lifestyle choice. ‘People move to picturesque places such as Tuscany because they want to be there and are now able to work remotely,’ he says. Mr Thomson, who has lived in Italy for 25 years, toyed with sending his sons to boarding school in England, but is convinced he made the right choice by sending them to International School of Florence. Some schools pride themselves on offering a truly British education, following the National Curriculum, IGCSEs (the international version of the exam, which doesn’t contain questions about UK-specific topics such as money or measurements and has less emphasis on correct spelling and grammar) and A levels. Others offer the International Baccalaureate (IB); some offer a combination of the two. But how can you be sure that the international establishment you’re considering will provide your child with as good an education as they would get at home? Miss Plyler admits that there are plenty of duds out there: of the 2,800-odd international schools worldwide, only 260 are recommended by GSGI. The major barometer is results, she says. Parents should look at the raw data as well as analysing where pupils then go on to university. Where possible, parents should also seek the opinion of other British families living locally and read any online reviews. The best establishments are the heart of the international community, where friendships are formed between all age groups. ‘It always amazes me how little bullying there is-the children are tuned in to making new arrivals feel welcome,’ Miss Plyler adds. Facilities and boarding houses occupy chalet-style buildings with panoramic views of the Swiss Alps and lessons are conducted in English with eight languages also on offer. Aiglon offers both a rigorous academic curriculum and a challenging extracurricular programme made up of hiking expeditions, skiing four times a week and service projects in Thailand, Peru and Rwanda. Founder of Round Square organisation, a network of 60 international schools. La Châtaigneraie (known as ‘La Chât’) is the most attractive of the International School’s three campuses, enjoying views over Lake Geneva. It’s popular with British families, many who are based on the right bank or northern part of the city. After attending the luxurious new primary school, pupils move on to take IGCSEs, followed by the IB, achieving excellent results: the aver- age score is 34 points out of a possible 45 (world average is 30). Le Rosey is among the most prestigious and expensive schools in the world-it’s known as ‘the school of kings’. The 380 boarders spend the winter months at the school’s premises in the ski resort of Gstaad and the summer at a manorial estate in Rolle on the shores of Lake Geneva. Lessons can be taken in either French or English and, as well as learning two or three further foreign languages, students are encouraged to develop their ‘multiple intelligences’ by participating in clubs and societies, sports and artistic activities. Set in a forest near Sophia Antipolis, France’s ‘Silicon Valley’, Mougins Schools is popular with families keen to give their children a British education on the Côte d’Azur. The 525 pupils are taught the National Curriculum by passionate teachers in a close-knit environment. Results have improved dramatically: in 2013, the pass rate for A level was 100% for the fifth consecutive year. Situated West of Paris, the Lycée International prides itself on offering not only bilingual, but bicultural learning. Core subjects are taught by French teachers to national standards and British teachers focus on British culture, language, history and literature. Founded in 1964 and situated in the smart 16th arrondissement, the ISP is the only fully Englishspeaking school within the city. It’s also the only school in France to offer the full IB. Small class sizes, enthusiastic teachers and plenty of extracurricular activities. In the prestigious market town of Croissy-sur- Seine, just 20 minutes by RER (commuter train) from the centre of Paris, The British School of Paris, France’s first British school, is one of the longest-established British international schools in the world. The junior- and senior-school campuses are located on an idyllic stretch of the Seine and there is a strong emphasis on pastoral care and sport. More than 90% of leavers gain places at their first-choice universities. Bordeaux International School, the only bilingual option in Aquitaine, is located in the heart of the city. From the start, children are encouraged to speak multiple languages (there is a French and an English teacher in every class) and it’s known for its music, art and drama and school trips across Europe. Sponsored by Airbus SAS and set up for the children of employees in the Toulouse aerospace industry, IST offers a solid British-style education. State-of-the-art information technology defines the school; all pupils from age nine are loaned laptops. Its IGCSE and IB scores are high compared to other international schools and there is an emphasis on art and music. In the village of Luynes near Aix-en-Provence, the IBSoP prides itself on its family feel: school life revolves around a typical Provençal mas, which has been converted into modern classrooms and laboratories. The boarding houses are dotted around the spacious grounds and there’s also a swimming pool, tennis courts and a new dining hall. Located on Quai Antoine 1er in the heart of the principality, the school offers academic prowess and a high level of security. The youngest pupils are taught half in English and half in French; English takes precedence for IGCSEs and the IB diploma, which is offered in the final two years. The school has a new performing-arts centre for music, art, drama and gymnastics. With its British public-school feel and large grounds situated 10 miles from the centre of Rome, St George’s is a major attraction for families considering a move to the Italian opportunities to explore the vast cultural heritage of Rome and Italy. A wide range of extracurricular activities include tackling a peak in the Alps, The Duke of Edinburgh International Award, table tennis, girls’ rugby, debating, drama, and Irish dancing. Occupying a large villa amid a beautiful garden with fruit trees, just 15 minutes from the centre of Rome, the school is known for its friendly atmosphere and historic feel. Small classes are taught the National Curriculum in state-of-theart classrooms with interactive whiteboards. It has spacious drama and art studios. Italian is offered to non-Italian speakers (the usual mothertongue is English) from Year 1 and all pupils study the language from Year 2. Staying true to its original mission to provide a high-calibre British education in Milan in a truly international environment, Sir James Henderson is an obvious choice for British families based in the city. The art and music departments are among the best in Europe-the school is the Associated Board of the Royal Schools of Music examining centre in Italy and students participate in field trips all over Italy. and cypress groves, and Villa Torri di Gattaia, near the Piazzale Michelangelo, 10 minutes’ walk from the centre. Facilities are excellent: computer labs, art studios, play areas and a new all-weather sports field. Situated near the beach in Castelldefels, 20 miles from Barcelona, the British School is renowned in the area for its friendly and welcoming atmosphere. The school follows the National Curriculum and prepares pupils for IGCSEs and A levels while immersing them in local culture and history. Spanish is introduced when children reach the age of four and Catalan at five. Some 94% of IGCSE grades are A to C.
both English and Spanish and achieve high results at GCSE and A level. A new boarding house opened in 2011. 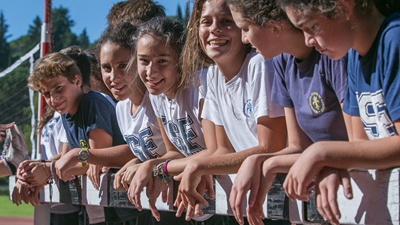 Day pupils and boarders from more than 40 different nationalities are educated at Sotogrande International School, which offers all stages of the IB programme. Top-class facilities include a large outdoor pool, modern labs and music rooms, libraries and theatre space. Boarders live in a former four-star hotel. Lessons are taught in English, but pupils are encouraged towards bilingualism; the average score at IB diploma level is 35 points out of a possible 45 (the world average is 30). with lessons taught in English and Spanish, culminating in IGCSEs and A levels (85% A*-C grades at IGCSE). Queen’s College, overlooking the bay of Palma, comes highly recommended by parents based in Mallorca. The school, which occupies a former convent, follows the National Curriculum, preparing students for IGCSE and A level, but it also encourages them to develop social skills and participate in sports and a wide range of extracurricular activities and clubs. Beach trips, farm visits and art exhibitions are always popular excursions. Set up for the offspring of the ‘free-spirit’ set who made the island their home in the 1970s, Morna’s curriculum once included Chinese calligraphy. Over the years, it has flourished into a highly respected institution teaching the National Curriculum to more than 300 pupilsmainly from Britain, Germany and Holland. Colonial in appearance, highly competitive and extremely successful, St Julian’s attracts many parents who would otherwise have sent their children to boarding schools in Britain. It’s the only school in the area to offer the National Curriculum up to GCSE level; pupils then go on to take the IB. Also known for its pastoral care, top-class sports facilities and drama department. A major feeder for St Julian’s, the International Preparatory School, which has some 260 pupils, is friendly and close-knit, with an emphasis on development, learning and play. It’s recently moved to a state-of-theart campus in Cascais that has excellent facilities including a well-stocked library and all-weather sports and play areas. Ages 3-18 years, day school São Lourenço in Almancil, west of Faro, is an established international school with a distinctly British feel, popular with families living in Quinta do Lago and Vale do Lobo. The school achieves excellent results; pupils are taught an adapted version of the National Curriculum and are also encouraged to participate in a wide range of sports and extracurricular activities. It’s also the only school on the Algarve to offer The Duke of Edinburgh’s Award.